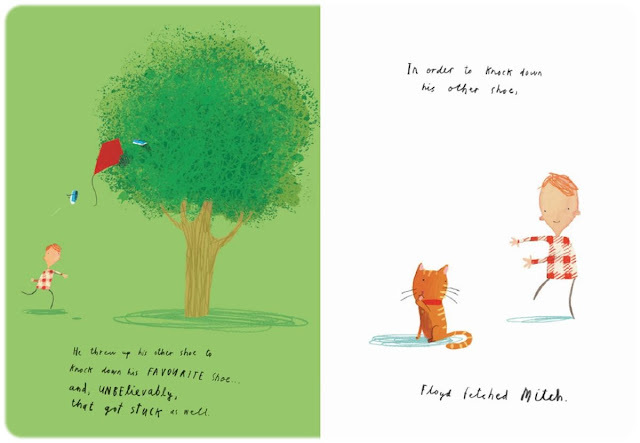 When I included Oliver Jeffers' book How to Catch a Star on my list of the Best Picture Books of 2010 I mentioned that I had overlooked his wonderful books for too long. Now that his new book Stuck is here I am going to dedicate a review to all eight of his books. But first, Stuck. 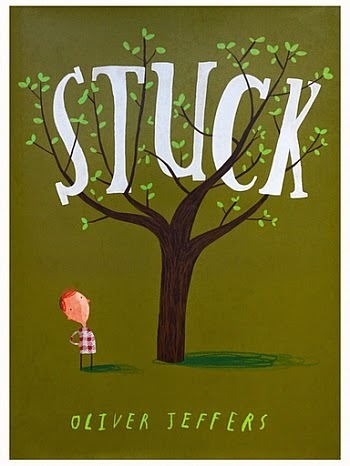 As Jeffers says of Stuck, it is "a tale of trying to solve a problem by throwing things at it." As you might surmise from this description, Jeffers' stories are as as uncomplicated and elegant, just like his illustrations. Before reading any of his books, I didn't think that the flat horizons and stick-legged characters Jeffers prefers could be as endearing as they are, but, there is something in the gestures, the colors and the occasional explosions of the exciting and unexpected, like the tree full of things in the illustrations below this one, that stick in your brain and make you think. If you take a look at his paintings (for adults) you will see that his seemingly simple picture book illustrations arise from more complex artistic talents. I find that this is often the case with something that seems simple: whether it is writing or art, it takes skill and genuine talent to create that which seems basic but, after experiencing, leaves you with a profound feeling, like the (mostly chapter) books I have reviewed that fall under the category Short books - BIG IDEAS. So, that was a longwinded way of letting you know that Stuck is about Floyd who, in an attempt to get his kite out of a tree, throws an increasingly huge and ridiculous number of things into the tree in an effort to knock the kite down. Jeffers' takes Stuck to the next level with a subtle twist at the end. Seemingly simple, kids are riveted by Floyd's story as the ridiculous nature of his endeavor escalates. When I last read this book at story time, I noticed parents riveted, and laughing, as well. I think it is actually quite hard to write a book picture book about the joys of reading without sounding coy, pedantic or obvious. However, Jeffers nails it with The Incredible Book Eating Boy. Henry discovers that books can be quite tasty, literally. To his surprise, he also finds that when he eats a book he gets smarter and he begins to eat almost everything he can find, although red books are his favorite. Eventually, he is so full that he finds himself feeling a bit ill and makes a visit to the loo. Henry decides he should find a new way to get information from books. Jeffers' illustrations are wonderful collages layered with pages of text, graph paper and notebook paper, adding depth to the story as it unfolds. In Lost and Found Jeffers manages to take the impossibly cute penguin and add a bit of stoicism to his countenance. When a penguin turns up at his door, the boy thinks he must help him return to his home. The two embark on an arduous, endless journey during which the boy tells the penguin stories to pass the time. When they finally reach the penguin's home, the two part ways, but uneasily so. Maybe something lost is actually something found? In 2008 Studio aka, created a 24 minute animated version of the book that looks stunning. Up and Down finds the penguin and his friend, the boy, faced with a new dilemma. Despite the fact that the boy has a plane, the penguin wants to learn how to fly on his own. He embarks on some fantastic attempts at flight, or, as Jeffers says in his description of the book, "gets ideas above his station." When the penguin finally gets his wish to fly, something is missing... When this book was released, Harper Collins held a contest for fans of Lost and Found. They got to spend the day with Jeffers and make this very different, very adorable book trailer. In The Way Back Home the Boy finds an airplane in the cupboard and takes a ride. When he runs out of gas he finds himself stuck on the moon with an alien, also stranded. The two work together and find a way to get out of their respective scrapes. 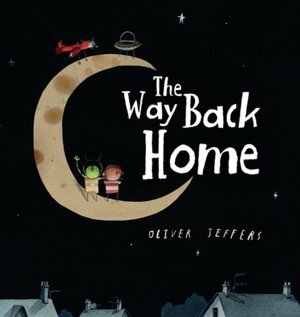 Sounds like pretty typical picture book fare, but, as always, Jeffers bring so much more to his stories, especially through the scope of his illustrations that capture vast spaces as the Boy travels in his airplane. How to Catch a Star, finds the Boy from Lost and Found and Up and Down fascinated by stars. Every attempt he makes to capture one ends in failure. As usual, Jeffers brings his imaginative, playful creativity to the Boy's endeavor. Jeffers uses words sparingly and the illustrations tell most of the story, making it even more powerful. In a great ending, which Jeffers exels at, the Boy finds his star in a very unexpected place. Be sure to check out Playing by the Book, an excellent blog by a mum and picture book lover who has great taste and superb skills when in comes to creating a craft from an inspirational book. She also shares plays, songs, movies and other books related to the title she is reviewing. For How to Catch a Star, she shared a nifty craft she did with her kids and lots of great links. 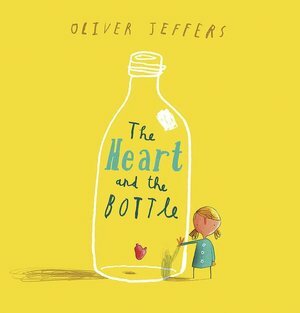 Again dealing with themes of loss and loneliness, pretty serious stuff for a picture book, Jeffers introduces his first girl main character. When her grandfather dies, in her grief, she tries to protect herself from being hurt again by putting her heart in a jar and wearing it around her neck. As Julie Eccleshare says of the girl in her review for The Guardian, "safety is colorless and life without wonder and inquiry turns out to be a dull thing. Can she get her heart back? With the help of a new friend she can, and once it has squeezed out of the bottle, life returns to a new kind of normality. Jeffers' visually spare style enables him to convey huge emotions with a minimum of fuss, allowing readers time to respond slowly." A bit of a departure from his usual themes, but with all the humor, quirks and stick legs, Jeffers presents us with a mystery in The Great Paper Caper. Jeffers describes it as a "thrilling tale of mystery, crime, alibis, paper planes and a bear who wanted to win." When the animals' homes start disappearing, along with several other trees in the forest, they decide to investigate. A very funny whodunit, Jeffers nevertheless manages to instill this story with a green theme. 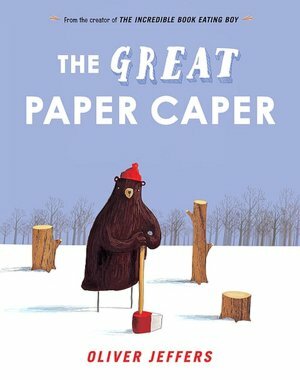 The Great Paper Caper is one of my favorite books to read at story time and at home.